And there are other profiles in use, such as C-slot (wedge cut out at the side of the core), Moon burner (off-center circular bore), and so on. But all of these are actually 2-dimensional bores, and it seems reasonable to me that such solid-fueled stages could benefit from a 3-dimensional grain geometry. Depending on the fuel and propellant mixture used (and with hybrid rocket stages that use solid fuels), some of the common ones seem adhesive enough to enable additive manufacturing techniques (a.k.a. 3D printing) to simply print a perfect grain geometry needed for the trust/burn profile. For example, Ammonium Perchlorate (NH4ClO4 or AP) or Nitrous Oxide (NO) are powerful oxidizers that are often used together with Polybutadiene ((C4H6)n, or PB) groups in HTPB or PBAN mixtures, together with aluminum (Al) powder and curing agents to form fairly homogenous and adhesive solid propellant grain, and with hybrid rockets, the solid cores that seem to be considered the most lately use paraffin wax. All these substances should be fairly straightforward to 3D print with, and could possibly even enable fine-grain control over fuel, oxidizer, binder / curative and catalyst components mixture. It might not be the most detailed print ever, but it would enable advanced grain geometry and potentially increase performance of hybrid rocket motors once the fuel is being depleted and the geometry of the oxidizer path changes, as is demonstrated to be a problem in e.g. High Performance Hybrid Upper Stage Motor (PDF). I'm not too sure that thermal manipulation could be used to such extent for non-hybrid solid motor grain where oxidizer is already a component of the mixture, but judging by Thermal Degradation of Polyacrylonitrile, Polybutadiene, and Copolymers of Butadiene With Acrylonitrile and Styrene (PDF), PB seems to be thermally stable without degradation beyond its evaporation point at roughly 407 °C. AP's melting point is at 240 °C and Aluminum powder melting point is at 660.4 °C (source). Of course, thermal manipulation required for additive manufacturing could be limited to temperatures that don't degrade the grain and simply (re)enable their adhesive properties before curing agents are applied and the layer is cooled down to a solid. And I doubt that high precision additive printing at high temperatures would be required to still benefit from a more complex 3D grain geometry than simple 2D and/or 3D geometries by stacking sections one atop the other permit. This might be especially useful for solid fuel grain geometry in hybrid motors, though. Has anyone already considered using state-of-the-art additive manufacturing techniques to 3D-print solid core propellants instead of casting them into molds or boring simple 2-dimensional profiles into them? which grain geometries could be considered first (honeycomb, bubble, helix, petal, non-homogeneous propellant mixtures,...) that can't be achieved using simple 2D grain geometry techniques (casting, boring,...)? Try looking at research done at The Aerospace Corporation, Penn State and Utah State. It turns out that there are very good reasons to print the fuel for hybrids. Adding a third dimension, beyond the images, above, of standard grain shapes can cause increased mixing of oxidizer and fuel, raising Isp. Regression rate was significantly increased in tests at both universities. Imagine image #3 above, where the star is swept through a helix, rather than made as a straight extrusion. A quick search does not turn up any projects in this direction. That's not to say nobody has thought about it, of course. The process has to be safe. Most of the current 3D printing processes apply heat to fuse the printed material together. Firing a laser at a bunch of propellant may not be an option. If you don't use heat, you'll have to wait for the propellant to solidify. Printing would take long. A single Shuttle SRB segment weighs 150 tons. When you're casting, you can pretty much dump the entire load in at once. May not be too much of a problem in the space industry, though. You'll have to prevent cracks forming in the propellant due to e.g. being too late to print the next layer. There have been efforts toward printing concrete. This has similar problems (curing time, size of concrete structures). 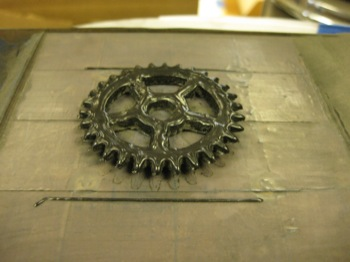 There are printers that can print wax, these prints are often used for lost-wax casting of e.g. silver. I haven't been able to find material specifications for the wax they use, though. First, binder Jetting is the most appropriate 3D printing technology for solid fuel modules, allowing complicated 3D structures without additional heat. The propellant, properly powdered, would be layered in thin layers on top of the previous layer, then an inkjet type head would selectively spray the appropriate binder to secure loose powder to the layer below, then the process starts again with another layer. It would be self supporting, but could not support voids since the voids would contain loose powder. In most solid rocket designs this would not be an issue. However, solid rocket motors have limited uses. Their primary benefit is low cost, but you make a number of tradeoffs for that, including less real-time control and fewer safety options. Quite frankly they are of limited use. The grain structures already designed provide sufficient variation in impulse over time, so that most mission profiles can be met without more specialized cores, so there simply isn't a need for a more complex grain structure. Once a mission gets to the point where a peculiar profile is required, the decision usually starts to tip towards liquid propellant designs, which offer a host of other benefits. 3D printed engines aren't going to drastically alter the landscape, particularly as we are now approaching 100% reusable launch vehicles. Not the answer you're looking for? Browse other questions tagged rockets technology fuel design solid-fuel or ask your own question. Can you print 3D with iron in space? How does solid propellant mean bulk temperature influence solid rocket thrust and specific impulse? Comparison between solid rocket fuels. Which are better by performance and cost? Which solid fuel is optimal for light rocket?